In the new book “The Distracted Mind – Ancient Brains in a High-Tech World,” authors Adam Gazzaley and Larry D. Rosen discuss the idea of goal interference. (referred to as “interference” in this post.) Interference is anything that gets in the way of focusing your attention on the intended target (the goal). Interference can come at us externally (i.e., through our five sense) or internally (i.e., our thoughts or physical sensations). The authors split interference into two types: distraction and interruption. • Distractions occur when there is no conscious choice to stick with the interference. • Interruptions occur when you decide to stick with the interference. You effectively choose to multitask by adding a new “goal” (the interference) to your initial “goal” (the original intended object of your attention). External Distraction – You are in a meeting with several colleagues at work. You receive a text message. You’re aware the text came in. You ignore it (you may or may not have noticed who sent the text). You maintain your focus on the meeting. External Interruption – You are in a meeting with several colleagues at work. You receive a text message. You see that it’s from one of your teammates who has a question. You respond to this text while continuing to “pay attention” to the meeting. 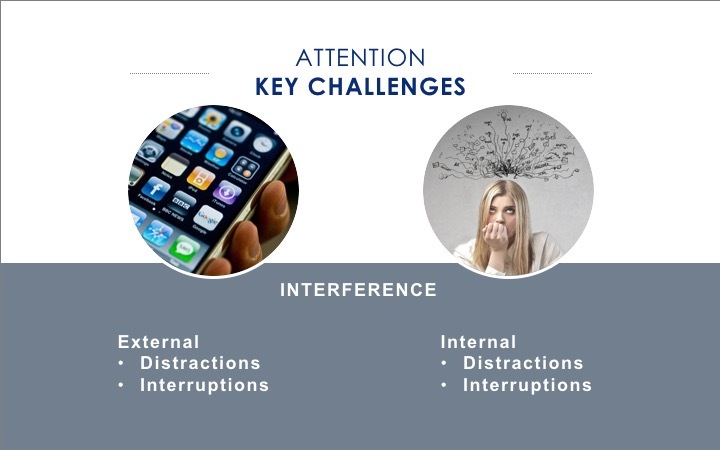 Internal Distraction – You are in a meeting with several colleagues at work. Somebody mentions the name of the VP (Alicia) of your org which triggers the thought that you are meeting with Alicia this afternoon. You know you’re not fully prepared for that meeting but you let go of that thought for now. You maintain your focus on the meeting. Internal Interruption – You are in a meeting with several colleagues at work. Somebody mentions the name of the VP (Alicia) of your org which triggers the thought that you are meeting with Alicia this afternoon. You decide to spend some time thinking about what else you need to do to get ready for that meeting while continuing to “pay attention” to the meeting.